While pundits and experts are churning out a plethora of books analyzing the causes of the 2008 economic crisis, it’s refreshing to find a practical book that provides some good thinking on how to manage for success in crisis situations. 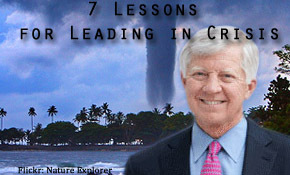 In his new book, “7 Lessons for Leading in Crisis,” Harvard Business School Professor and former Medtronic CEO and Chairman Bill George, provides a concise handbook for applying proven leadership lessons in tough times so that companies and individuals can emerge successful on the other side of crises. Whether it’s the current economic crisis, a product recall or the loss of a job or a spouse, George’s book offers realistic actions leaders can take to put their companies and themselves on the right track. What does George know about leading in crisis that makes him an expert on the subject? It turns out quite a bit. As Medtronic CEO, George earned a reputation for managing with integrity and challenging people to think creatively when dealing with crises. That approach helped establish Medtronic as the world’s leading medical technology company that experienced explosive growth of nearly 35% per year. In addition, as a member of the Goldman Sachs Board of Directors, George had a front-row seat as the recent financial crisis rocked the world. George’s lessons include: Face Reality, Starting with Yourself; Never Waste a Good Crisis; and Be Aggressive: This is Your Best Chance to Win in the Market. In addition to providing practical advice, George shares real-life stories, anecdotes and a wealth of wisdom for current and aspiring leaders. He says the natural reaction when facing a crisis is to “hunker down,” batten down the hatches and ride out the crisis. Rather than running for cover, George believes every crisis provides an opportunity to emerge as a stronger, more vibrant company or individual on the other side. During difficult times, employees look to leaders to fill-in-the-blanks with answers and reassurance. George advises leaders to take a team approach to solving problems. Beyond that, George urges leaders to establish an external support network — a person or group of people they can be totally open with and to bring perspective to a situation. It isn’t a secret that crises are the true test of leaders. And George believes most effective leaders don’t wait until they’re in charge to learn how to deal with crises. George says he has seen a number of leaders fail because they didn’t have prior experience in leading a crisis. Overall, the key quality of good leaders is adaptability. George says his experiences, and the experiences of others, have proven to him, that you have to be in the game to learn. For more information, please visit www.billgeorge.org for videos, and activities. Also, look for the study guide in the back of the book. It’s a great tool for small groups to use in working through the lessons together.